We are involved in manufacturing and supplying an array of Traction Apparatus. We offer these products to the clients in diverse uses such as spreader bar, cord, head holder, and optional water/sand weight bag. These are useful and effective recommended by the doctors. 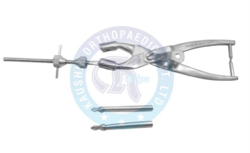 We are one of the top most reliable organizations in our sphere catering to hospitals and orthopedic centers. 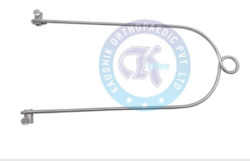 We are engaged in manufacturing and supplying of Crutchfield Tong. The materials we use are sourced from authentic vendors. These are highly praised for their effectiveness, durability, and corrosion resistant. These are considered ideal for broken necks. 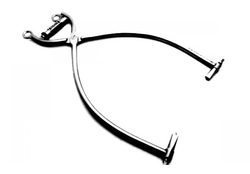 Our instruments are available in different sizes and designs for the client and at most competitive rates. . Besides, our products meet all the industrial qualitative requirements as these are manufactured under stringent supervision and guidance of our professional and technical experts.